- 40 members attended our annual meeting, Saturday, July 14th at the Schrupp residence. Club VP Andy Becker lead the meeting, with reports on membership, club funds, Trail Ambassadors, Search & Rescue ATV Team, and new projects underway. -We thanked the Schrupps for hosting many meetings, including our very first in July of 2009, and gave them a few gifts. They are planning to sell their place in the future. -Theresa Meyers and Heather Emerson were elected to the club board, and Dave Shaw and Sherrie Gayken were re-elected for another 3 year term. Congratulations and thanks to all! 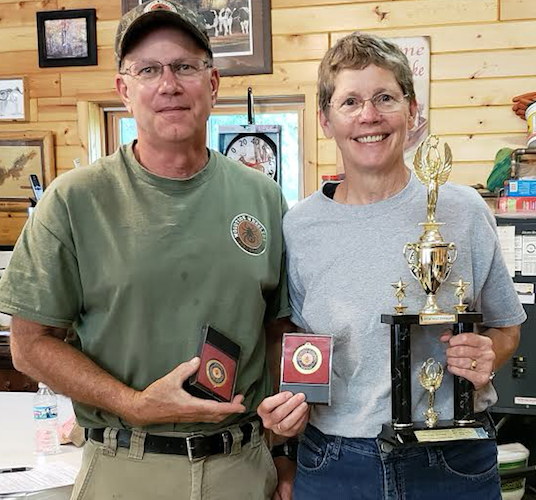 -Congratulations to Dave and Pam Shaw, who were named Members of the Year for their years of volunteer work and positive attitude. 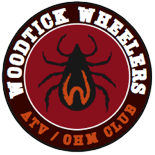 -We learned during the meeting that recent storms had knocked down many trees, blocking the trail south of the shelter at Hovde Lake, so the club ride up to Huddle’s had to be cancelled. -Instead, we drove there in our trucks and cars and enjoyed a buffet lunch of pulled pork sandwiches and sides, compliments of the club.